The Rockhurst University Hawks, a Division II program from Missouri, weren’t messing around when they arrived at Wintrust Arena Thursday night for a date with the DePaul Blue Demons. The final score, 72-65, doesn’t indicate how competitive the game was. Down seven points with 2:41 to go, Hawks senior forward Auston Rushing hit a 3-point field goal to cut the Blue Demon advantage to four points. 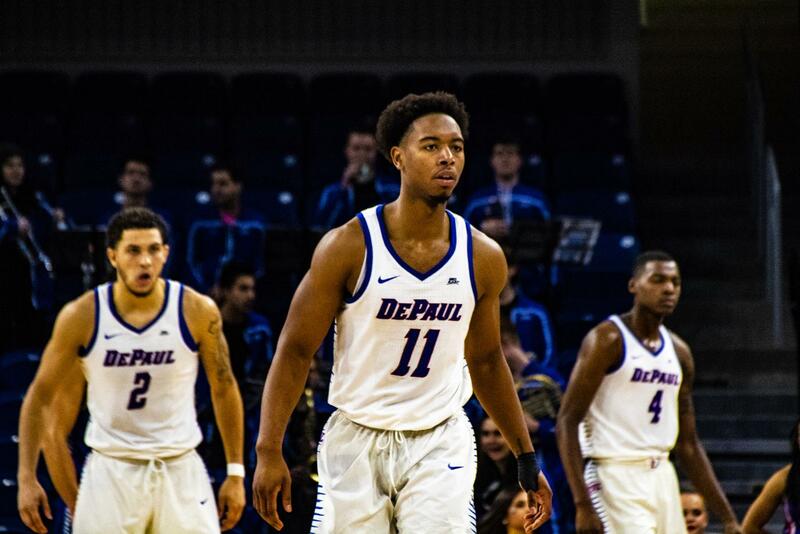 It was the closest the Hawks would get the rest of the game, as the two teams traded off baskets and then the Blue Demons hit free throws to escape with a victory. The Hawks were competitive from the get-go. The first 10 minutes of the game, chalk it up to a small program making the most of its opportunity against the big boys, Rockhurst’s NBA Finals if you will. But as the game ticked on and the disparity in the score didn’t change, it went from a cute story to this team is for real. A layup from Hawks sophomore guard Chris Hamil cut the Blue Demon advantage to three points with 3:54 left in the first half. A gritty defensive play by Hawks forward Connor Evans where he poked away the ball from Cain then dove to the floor to retain possession set up that basket. But then Blue Demon sophomore big men Jaylen Butz and Paul Reed realized they were the two biggest guys on the floor. Butz scored on two-straight possessions, then wiped out a transition opportunity for the Hawks with an emphatic block. On the next possession, Reed grabbed a Strus miss midair and smoothly put it back with one hand to extend the lead to six points. The next possession, Reed discarded two Hawk defenders for an offensive rebound that led to an easy layup. Rockhurst sophomore big man Quinton Curry hit two free-throw attempts to knot the game at 47 with 12:37 left in the game. It was made possible by four turnovers in a lousy five-minute stretch by DePaul. Out of the under 12-minute timeout, the intensity defensively amped up for DePaul and the Blue Demons went on an 8-2 run. But they still couldn’t shake the pesky Hawk who were in the game the entire second half. After a bad first half, Cain finished with a game-high 19 points. Reed added 12 more on 6-for-9 shooting as the bigger Blue Demons unsurprisingly enjoyed a 42-26 advantage in points in the paint.